As part of a large scale modernization program, the Mineta San Jose International Airport recently installed a 1.12 MW roof-mount PV solar system, the largest such system at any U.S. airport. Sometimes the capital for renewable energy investments comes from a variety of sources. Unexpected cost savings during construction of a new terminal at Mineta San Jose International Airport allowed the airport authority to acquire a 1.12 megawatt photovoltaic system much sooner than planned. 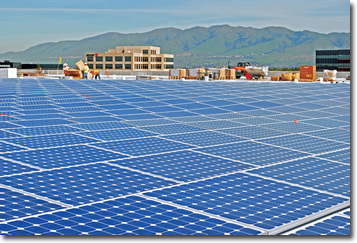 The system, consisting of 4,680 Canadian Solar CS5P monocrystalline modules, was installed on 3.4 acres atop the new public parking garage and rental car center. It should provide about 20 percent to 25 percent of the facility's electricity. When the system went online this past June, it became the largest municipal solar installation in San Jose, a city that Mayor Chuck Reed touts as the "world center of cleantech innovation". Since Reed took the helm of the Silicon Valley city in 2007, at least eight solar companies have moved or expanded there. 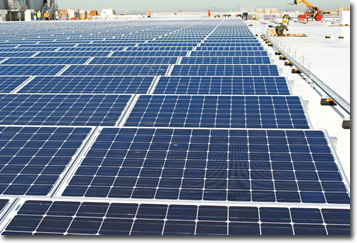 The installation at Mineta San Jose is also the largest roof-mounted PV system at a U.S. airport. The garage was designed with solar in mind, but airport authority officials thought it would be several years before they could afford to install it, says David Vossbrink, spokesman for the airport authority. The building is aligned north-south and has a smooth roof with few protrusions, says Todd Mazza, division manager in San Jose for Rosendin Electric Inc. The garage is also a heavy energy user with lighting on every floor and multiple motor loads for the QTA (quick turn-around) area. The city had requested proposals for PV systems twice during terminal construction but, each time, decided against it. "The airport and the city of San Jose have always strived to get solar, and they put out a couple of RFPs for the solar portions. But it never penciled out," Mazza says. "So they held off. It wasn't until the middle of last year that we could recognize the significant savings we achieved during construction would allow enough room in the GMP (guaranteed maximum price) to fund the solar installation." Under a GMP contract, if a project comes in under cost, then the entity that let the contract benefits from the savings. If the project exceeds the projected costs, then the contractor must absorb the overruns. "A lot of the estimating is theoretical because, at the time we come in to bid a design-build job, there may only be a basis of design and perhaps some conceptual drawings," Mazza explains. "We have to envision what the project will look like and put numbers to that." GMP-type projects have benefits for both the contractor and clients such as the airport, he says. "It's not the contractor versus the owner," Mazza says. "It's a cooperative effort. We all strive to do what's best for the project." The GMP-provided savings, coupled with California's solar incentive program, enabled San Jose to move forward on a solar installation much sooner than expected. As a government entity, the airport authority can't take advantage of federal tax rebates. But the California Solar Initiative, signed into law in 2006 by Gov. Arnold Schwarzenneger, doesn't have those restrictions. Rosendin Electric selected the ISYS Roof Mount racking system, from Unirac Inc., based on the roof configuration at the airport. The racking system is pre-fabricated, so it can be assembled in the field without any welding, drilling, or cutting. It also has 30 percent fewer parts, all of which led to record-quick installation. "Usually the rebates are set up as tax incentives, and that doesn't help us at all," Vossbrink says. "But we could take advantage of the California Solar Initiative, and that actually made this project pencil out." The state solar program offset about $1.5 million of the project's overall $6 million price tag. The airport had hoped for a bit more, but the initiative limits projects to less than 1 MW. The airport's PV system is 998 kilowatts AC. The parking and rental car garage construction was part of a $1.3 billion modernization at Mineta San Jose International Airport. The new Terminal B will replace the aging Terminal C, built in 1965. The interior of Terminal A was completely modernized. The seven-story, 3,350-space parking and rental car garage sits across from the new Terminal B and allows rental car companies to wash and refuel vehicles onsite. When it looked like the solar project would become a reality, Integrated Power of Novato, California, was brought in to do the initial design and engineering, Mazza says. Rosendin Electric, the airport project's electrical contractor, provided oversight for the engineering and then installed the PV system. The employee-owned company had teamed with the airport project's lead contractor, Hensel Phelps Construction Co. of Greeley, Colorado, on projects in the past and continued that excellent working relationship on the airport project, Mazza says. 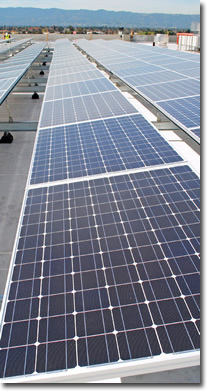 Rosendin put out RFPs in mid-November 2009 for companies to supply the solar panels, with emphasis on local providers. "They probably made 30 phone calls and an equal number of emails to local companies and established companies," Mazza says. Rosendin had specific requirements during the bidding process. The company had to have been in business for at least five years and have experience providing panels for a large, commercial project of at least 1 MW. "We needed someone who was going to be able to back their product, not just tomorrow, but 10, 20, 25 years from tomorrow, and we had concerns if they were not an established company," Mazza says. "We wanted established technology, someone who was familiar with the industry and had the manufacturing capability and production." In the end, Rosendin went with Canadian Solar, which is based in Kitchener, Canada. The company also has offices in California. "They provided the best proposal for the project when the bids were evaluated for price, production, and rebate value," he says. Another attraction was the efficiency of Canadian Solar's panels, Mazza says. The solar industry has gravitated away from STC (Standard Testing Conditions) ratings toward PTC (PV-USA Testing Conditions) ratings, says Mike Miskovsky, U.S. general manager of Canadian Solar. In the past, a panel with an STC rating of 100 watts may have only received a rating of 89.4 watts under tests conducted by an independent laboratory using PVUSA testing methods. The Canadian Solar panels on the garage rooftop are fixed at a 10-degree angle, and the system is rated for winds up to 80 mph. The system has two 500 kW Solaron inverters from Advanced Energy Industries Inc. The PTC-PVUSA rating is typically 10 percent to 15 percent lower than an STC rating. It's not that the manufacturer was trying to deceive the customer. A lab using PVUSA testing conditions just uses a different set of parameters. Because PVUSA tests panels from manufacturers head to head, it allows users to compare apples to apples, Miskovsky says. And the PTC rating better reflects how a panel will perform under real-world conditions, he says. "From a Canadian Solar perspective, we're very pleased with the way we have rated out in the PTC-PVUSA efficiency," Miskovsky says. Additionally, the solar panel PTC rating was required to qualify for the California Solar Initiatives. 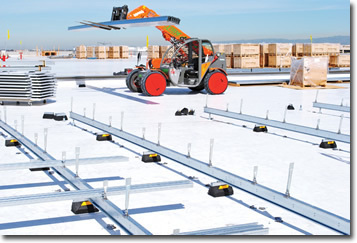 Rosendin chose the ISYS Roof Mount racking system based on the roof configuration. "We evaluated a few of the options available, and we felt with the roof being what it was, which was nice and flat, the ISYS had a pretty economical installation method," Mazza says. The racking systems are pre-fabricated, so they can be assembled in the field without any welding, drilling, or cutting. They also have 30 percent fewer parts, all of which led to record-quick installation, he says. Albuquerque, N.M.-based Unirac Inc., which manufactures the ISYS, touts the system as having one of the best strength-to-weight ratios, making it ideal for large-scale projects. The panels on the garage rooftop are fixed at a 10-degree angle, and the system is rated for winds up to 80 mph. The system has two 500 kW Solaron inverters from Advanced Energy Industries Inc. of Fort Collins, Colorado. Construction was started on the PV system at the beginning of March, and the system was completed and commissioned by the end of May. Although Northern California experienced an unseasonably rainy spring, Mazza says they only had a few days when it was too wet to work on the project. Rosendin didn't have to contend with working around passengers, either, since that portion of the airport had been cordoned off for terminal construction and was outside of any security area. Occasionally, the company did have to close a traffic lane so a crane could get in to pick up materials. Rosendin also consulted with the Federal Aviation Administration to ensure that any glare from the panels would not create a potential danger for airplane pilots. The airport authority decided to own the solar project outright rather than enter into a power purchase agreement because of the economics, Vossbrink says. In fact, the city issued two requests for proposals for PPAs. "They didn't come back as positive as we had hoped," he says. "We didn't get proposals that were competitive, and they had to be satisfactory for our partners, the rental car companies, and for the airport." Construction started on the PV system at the beginning of March, and the system was completed and commissioned by the end of May. Although Northern California experienced an unseasonably rainy spring, there were only a few days when it was too wet to work on the project. The rental car companies have long-term leases with the airport, so the authority had to be careful not to agree to a project that would make those arrangements uncompetitive, Vossbrink says. Although the airport hasn't contacted them about maintenance of the system, Rosendin will provide strength-level monitoring so the airport authority can see if any portion of the array is not generating up to the rating level. "They get that data back and can see if the strength is out of whack. A module could have clicked off or a segment is dirty," he says. Maintenance basically involves cleaning the panels periodically to remove dust that might impair generation.